So much of your work makes such great use of black and white, to the effect that the instances in which color is used are very striking. Can you talk about your use of color? I wasn’t into comics as a kid, so I don’t have much sentimentality about old Marvel or DC stuff, which is FULL of color. When I look at those comics, I get overwhelmed, and I don’t know where to look. All bright colors everywhere—everything’s at the same level of saturation. One of the best things I learned in school was the power of a limited palette. Just a touch of color on a largely black and white page draws the eye. So, you can use color to emphasize sections of a comic or to direct the eye. I’ve noticed a few different artistic styles across your body of work. How does the written content dictate the style of art that you develop for each specific piece? The first answer, and probably the most accurate, is that I have a bunch of styles because I’m still trying to find a “look” for my work—eep! I’ve always found it easier to draw from life or to copy other people’s work than it is to draw from the imagination. This is a big problem for me right now. The second answer, which is related to the first, is that I can’t draw as well as I’d like to draw, so the style of any particular piece is just whatever feels good that week, whatever I can pull off and not be ashamed of. The third answer has to do with time—realism takes longer, so drawing more cartoony figures is sometimes more efficient. Content definitely dictated style for “Invisibility,” and for a good reason—Edward Gauvin’s trying to get at something a little complicated and very specific in his work, so the style is pretty clear and abstracted, oriented more towards symbol than realism, so that the reader doesn’t have to spend too much time “translating” the drawings. For me, more detailed, realistic drawings often take longer to convert into “meaning,” and that’s because they’re open to more interpretation. The less there is on the page, the fewer distractions the viewer has, the fewer options for interpretation. Symbols, by definition, are more specific. Here, we wanted the drawings to serve the content of the piece rather than force them to pause and come up with their own interpretations. So, for the same reason, we sometimes needed the style inside the piece to change. For example, Edward wanted to refer to the painter Magritte in “Invisibility.” For readers to get the reference, those panels had to refer to Magritte in style as much as symbol. That’s why they’re in color and more painterly. In “Invisibility,” you’ve adapted Edward Gauvin's essay about writing English translations of fiction and poetry to a graphic format. Can you tell us about this adaptation process? Working with Edward is great. He sends me the essay in script format, so I’m not doing an initial layout. This gives us a great starting point. I usually send him some sketches, and then we talk over the phone about the nitty gritty details. Most of my problem-solving work happens at this stage, where we’re ironing out the layout before I create more polished drawings. I usually start on paper and then, after the thumbnails stage, go digital. In “Lady in Ink,” I was particularly struck by your creative and effective placement of text. Can you talk about what goes into your decisions regarding text? Placing text is always tricky. It’s where the eye goes to first, which can be a problem. I don’t know about you, but I have the bad habit, when I’m reading comics, of just reading the speech balloons and glossing over the images. (I know, what a terrible thing for a cartoonist to say!) But it’s true. I have to force myself to slow down and take in the images. “Lady in Ink” was a text-heavy essay, so when I turned it into a comic, one of my biggest challenges was placing the text in a way that encouraged the reader to actually look at the picture. Sometimes that’s about placement, but sometimes it’s about leaving something out of the text, so that the reader has to look at both the image and the text to get the full meaning of the comic. What are you reading right now? What are you excited about in the world of graphic literature? I’m reading Roxane Gay right now, and she’s funny and striking and punchy, which is great. She’s coming to my university in the spring, so I’m hoping to teach her work this semester. I mentioned Jared Muralt earlier—I just got The End of Bon Voyage, which is a beautiful book about a shipwreck in an ocean-less landscape. It’s not his most recent work—The Fall is more recent, and also worth reading just for his colors—but in Bon Voyage, he uses stippling and cross-hatching to great effect. I’ve been trying to imitate his work in my sketchbook. I’m also reading Elanor Davis’s new book Why Art? Her drawings blow me away, as does her brilliant and efficient juxtaposition of text and image. I don’t know if this counts, but I’m spending a lot of time taking online drawing classes—from The New Masters Academy, Proko, and Ctrl+Paint. I took a couple drawing classes in college, but they weren’t enough, not nearly enough, so I’m trying to get better. And these classes are great because they’re aimed at a more professional audience. College was all about ideas; these classes are all about craft and technique. CLAIRE STEPHENS is a cartoonist and a writer, mostly of science fiction and personal essays like Lady in Ink, a comics chapbook about tattoos and gender that was released in 2015 by Sweet Publications. You can find her work in magazines such as Words Without Borders, Prick of the Spindle, and A Bad Penny Review. She received a 2013 Outstanding Thesis or Dissertation Award at the University of South Florida, where she currently teaches writing. Her comic "Invisibility," created with writer Edward Gauvin, can be read in the Fall 2018 issue. 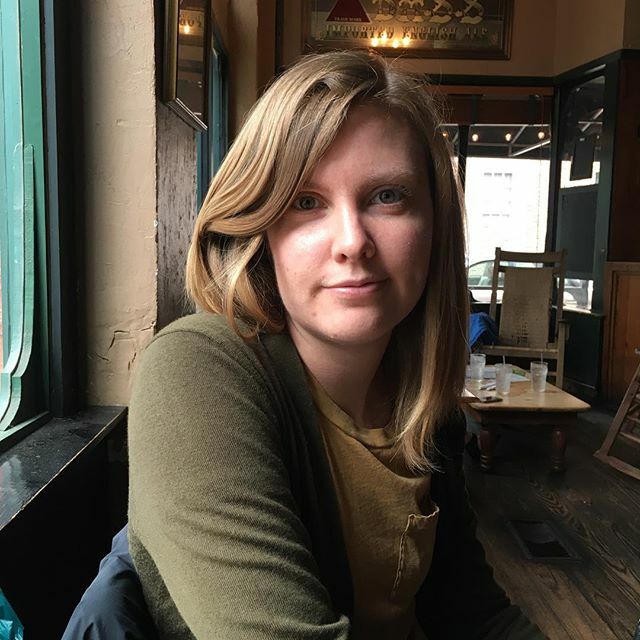 CLAIRE PINCUMBE is a second year MFA student in the University of Arkansas Program in Creative Writing & Translation. She is currently the Comics Editor of The Arkansas International.